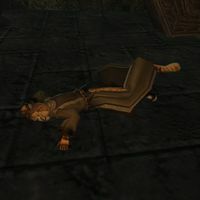 Urjorad was a Khajiit healer in the Imperial Cult who perished in the Daedric shrine of Ashalmimilkala. He was the apprentice of Dro'farahn Stiff-Neck, an Imperial Cult priest who was slain by Carecalmo and Meryaran, two worshippers of Mehrunes Dagon. Urjorad swore an oath to avenge the death of his master, and armed himself with his master's clothes and weapons and the Scroll of Fiercely Roasting. The other cult members tried to talk him out of it, as Carecalmo and Meryaran was far too strong for him, but he was so determined to pursue his master's killers that they were unable to stop him. The cult Oracle Lalatia Varian fears that he is dead, and will ask you to recover the scroll from his body so it will not fall into the wrong hands, and suggest that you avenge Urjorad and his master by finishing off their killers yourself. He carries a Divine Judgement Silver Staff and a Chameleon Ring, along with some healing potions. He is actually listed as a merchant (dealing in potions) and a minor trainer in restoration, mysticism and alteration in the construction set. Since he is dead, he cannot actually provide any of his services though. This page was last modified on 18 November 2013, at 20:27.